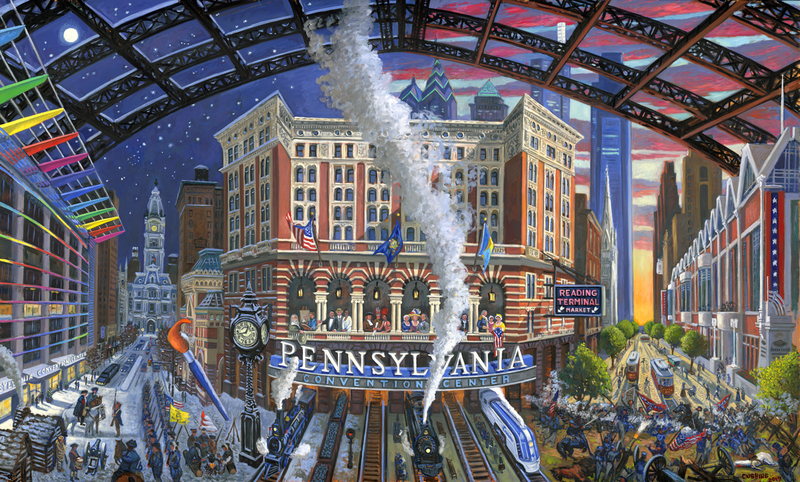 In this oil painting commissioned by the Pennsylvania Convention Center, Cushing designed a composition using three disparate views to illustrate the handsome facades of different areas of the Convention Center building. On the left is the new entrance on North Broad Street (across from his alma mater, PAFA), in the center is the Market Street entrance in the restored Reading Terminal head-house, and on the right, the art-deco inspired facade on Arch Street. Overarching all is the cast-iron girders of the train shed, an important architectural feature that was retained by the Convention Center. In a dream-like juxtaposition, Cushing included classic locomotives that are part of the history of the Reading Railroad, as well as two of Pennsylvania's most important historical events, the "Winter at Valley Forge" and "Pickett's Charge" at the battle of Gettysburg. There is also a contrast between the modern street view on the left and the "circa 1900" period view on the right. Historical personages who were prominent in Philadelphia are placed between the pillars on the balcony. The figures in the loggia (from left to right) include: Walt Whitman being painted by Thomas Eakins; 20th Century figures Mario Lanza, Connie Mack, and Marian Anderson; William Penn’s Treaty with the Indians; Ben Franklin with his wife and a French patron; by himself is Edgar Allen Poe; and at far right is George Washington with Betsy Ross and her daughter. The overall theme is to represent the Pennsylvania Convention Center in the context of the history and tradition of service which it occupies.